The Strange Career of "the City on a Hill"
Today's guest post comes from Ben Wetzel, who is a PhD student in history at the University of Notre Dame. He has published in the Journal of Church and State, as well as in The Activist Impulse: Essays on the Intersection of Evangelicalism and Anabaptism (Wipf & Stock, 2012). His dissertation will focus on the intersection of American religion and politics, 1865-1920. Perhaps the most famous article in all of American religious history is Perry Miller's 1953 piece in the William and Mary Quarterly entitled, "An Errand into the Wilderness." 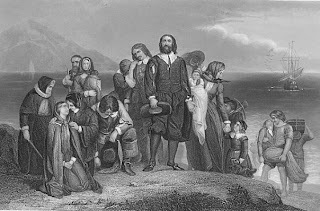 Originally delivered at a meeting of the John Carter Brown Library in 1952, "An Errand into the Wilderness" reconceptualized the idea of a Puritan mission to the New World. Expanding upon themes he had developed in The New England Mind (1939), Miller proposed that John Winthrop intended the Massachusetts Bay Colony to be a model for Europe (and perhaps the rest of the world) to imitate. To buttress this view, Miller seized upon several lines of Winthrop's now famous Modell of Christian Charity: For wee must Consider that wee shall be as a Citty upon a Hill, the eies of all people are uppon us." At the conclusion of his article, Miller even implied that there was a direct connection between Winthrop's vision and the founding of the United States: "Having failed to rivet their eyes upon their city on a hill," he wrote, "they were left alone with America." To students of American religion, this connection between the "city on a hill" and the mission of the United States is hardly a new concept. Anyone familiar with the rhetoric of Ronald Reagan, for example, knows that the president frequently connected the two ideas, adding the adjective "shining" to describe the model city. Today Democrats and Republicans alike employ the image to describe the example they believe the United States should set for the rest of the world. But to previous generations of Americans, the connection would not have been obvious. 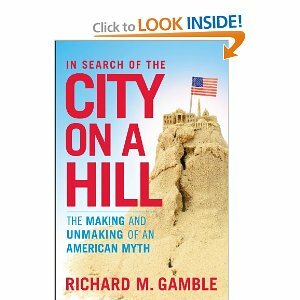 In a wonderfully enlightening book, In Search for the City on a Hill: the Making and Unmaking of an American Myth (Continuum, 2012), historian Richard M. Gamble of Hillsdale College traces the evolution of the phrase's meaning in American history. He argues that the phrase "city on a hill" (found in Matthew 5:14) originally described the mission of the church, but that over time the secular state has come to exert a near monopoly over the image. Gamble begins the book with surprising observations about Winthrop's famous discourse, A Modell of Christian Charity. Much is unknown about the circumstances surrounding the sermon's composition. Indeed, since no one onboard the Arbella (the ship that transported the Puritans from England to Massachusetts) ever left any record of the message, and since Winthrop himself never mentioned giving the speech in his journal, Gamble concludes that it is possible that the governor never delivered the discourse at all. In any case, Gamble points out, Winthrop could hardly have been envisioning the United States, whose tenets of toleration, individualism, and democracy the governor would have found appalling. Proceeding in time, Gamble traces the fate of the "city on a hill" throughout American history. Jonathan Edwards, for example, used the image in the 1730s to describe his Northampton congregation, but did so usually to chastise his church for failing to uphold true godliness. When Edwards used the image, however, he was not alluding to Winthrop's vision, because A Modell of Christian Charity was not published until 1838. Few observers in the 1830s noted its appearing, and none thought they saw the origins of the American mission in its contents. Indeed, over the next century, writers who quoted from the document almost never drew attention to the "city on a hill" passage at all. The transformation of the image began with Perry Miller's revisionist work in the second third of the twentieth century. A professor of literature at Harvard, Miller rescued the Puritans from the ill repute to which previous generations of historians had consigned them. Although he himself was an atheist, Miller admired the Puritans' intellectual world and did a great deal to rehabilitate them for the twentieth-century academy. As we have seen, his "Errand into the Wilderness" article proposed a greater importance for the Modell of Christian Charity than previous scholars had supposed. Still, it was not an academic but a politician who first used the phrase in a more public setting. And his name was not Ronald Reagan. Instead, John F. Kennedy (reading a speech prepared by his aide Ted Sorenson) declared to the Massachusetts state legislature in 1961 that he "had been guided by the standard John Winthrop set before his shipmates on the flagship Arbella three hundred and thirty-one years ago, as they, too, faced the task of building a new government on a perilous frontier." And then: "'We must always consider' [Winthrop] said, 'that we shall be as a city upon a hill--the eyes of all people are upon us.'" Clearly, as Gamble points out, the Irish-Catholic Kennedy's conception of the "city on a hill" was a far cry from what Winthrop would have envisioned in the seventeenth century, let alone what Jesus was describing in the gospel of Matthew. It is unclear if Reagan learned of the phrase directly from Kennedy or picked it up elsewhere, but in any case the Great Communicator made the image his own in the last third of the twentieth century. As with Kennedy, Reagan's use of the "city on a hill" was largely devoid of any specifically Christian content. Instead, as the high priest of America's civil religion, Reagan deployed the image as a stand-in for a vague Americanism. Although some critics of the president, such as New York governor Mario Cuomo, argued that there was a good bit wrong with the "shining city," for the most part the phrase had been adopted by both parties and emptied of any prophetic content by the end of the twentieth century. In addition to Gamble's persuasive argument and admirable conclusion, which calls present-day Christians to think more discerningly about the differences between the City of God and the City of Man, there is much to like about this book. First, it is written in an accessible style that is attractive to a general audience as well as to the historical profession. Gamble's decision to publish with Continuum (a division of Bloomsbury) and his frequent references to "the reading public" demonstrate an important resolve to speak to a wider group than the academy. Since the subject matter should be interesting to many kinds of people, and since Gamble is professionally qualified to write about American history, In Search of the City on a Hill seems to me to be an ideal example of what popular history can be. Second, drawing on the writing of historian John Lukacs, Gamble calls us to think less about what ideas do to people, and more about what people do with ideas. Since ideas never exist in a vacuum, scholars of all kinds might fruitfully consider tracing the changing shape of ideas over time. In Search of the City on a Hill is a needed corrective to popular misconceptions about the Puritans, the "city on a hill," and United States. Although some of this book's argument has been anticipated before (especially in Theodore Dwight Bozeman's To Live Ancient Lives: The Primitivist Dimension in Puritanism [UNC, 1988]), Gamble's work is refreshing and necessary in the twenty first century. Sounds like I'll need to get this book. Thanks for the informative, insightful review. Or perhaps despite it--historians are prone to exceed their pay grade a lot lately. Excellent and useful review--thx, Heath.